Final Fantasy is my all time favorite franchise! Final Fantasy has been going strong for almost 25 years now with over 100 Million copies sold around the world. 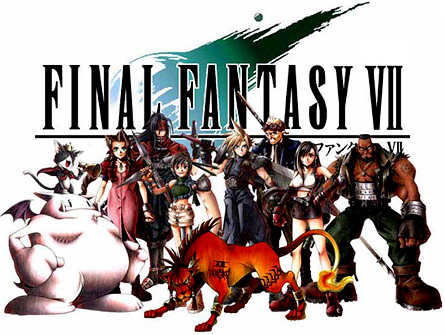 The Final Fantasy franchise consists of games, music, movies and more. I could go on but this isn't a history lesson. If you are interested, you can Google it or check it out on Wikepdedia. I was having so much trouble deciding what to put here as I could probably go on for a while. I like Final Fantasy so much I even had one of the songs played at my wedding (see "Eyes on Me" below). So I just picked a few of videos and pictures from the game and put them below. Take a look at the image to the right. What do you see? I see a friendship, love and a story that takes place in a whole new world. Now take a look at the background image. If you want to see it without all the text, Click here. This is a picture of Aerith from Final Fantasy. The picture is a representation of Aerith casting the holy spell which is one of the most memorable scenes in all of the Final Fantasy games. I played my first Final Fantasy game back in 1990 (I think). I bought it used from our local video store for $15. The game really sparked my imagination. Unless you've played the games or heard the orchestrated music, it's difficult to see what I see. I've had many people say "it's just another video game." I don't know if I can ever describe what makes Final Fantasy so great. Below I share some of my favorite Final Fantasy things. I hope you find them interesting. Who knows, maybe you'll become a fan too! Prologue! This video at the right is the iconic Final Fantasy Prologue. The clip says it's about 2 minutes but there is only 1 minute of music here. I still chose this because it was the only orchestrated version I could find. In my opinion Final Fantasy 7 was the next evolution in gaming. If you look at it now, the graphics aren't spectacular compared to what you see these days, but keep in mind Final Fantasy 7 came out in 1997. I was in College when my cousin and I played this game. The game had a huge world to explore and a large cast of characters (seen to the right). Mystery, Love, Adventure, Sadness and of course great music tied the game together. Aerith (aka Aeris) was one of the more memorable characters of the game. (SPOILER ALERT) In fact, the scene where she died shocked the gaming world. That scene was accompanied by one of the most popular game songs of all time. I talk more about that in the Nobuo Uematsu page I have. Like everything else you have to play it to understand, but I found a good video accompanied by a fully orchestrated version of Aerith's Theme. The game was so well written, that like a good movie, when playing, I truly felt like I was part of their world. I could relate to the characters and really see them evolve and grow friendships and love. I hope you Enjoy the music and video! There are so many videos and pictures for Final Fantasy out there. 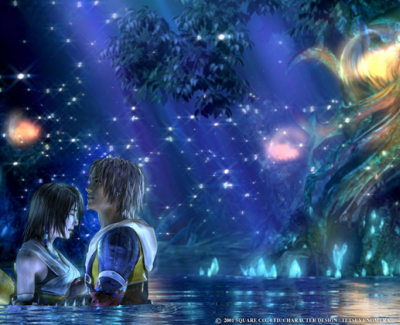 Check out You Tube or Google Final Fantasy Images to see more. Here are a few of my top pics. This is the song "Eyes on Me" from Final Fantasy 8 (1999). This was played at our wedding! Here is the remake of the opening to Final Fantasy 4. I love what they have done with the cut scenes. This is Tifa's Theme from the Final Fantasy VII Advent Children Movie. From Final Fantasy XIII. A really cool scene. I like the song that plays in the last minute or so. I found this video and it has some really cool scenery from Final Fantasy 14. I think this is in HD it looks so great on full screen!